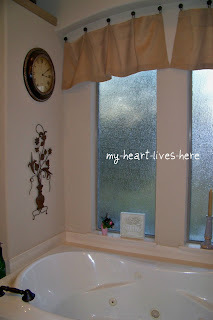 One of the things I have most wanted to do with this house, but never gotten around to, is to create a treatment for the window in our master bathroom. It is a tricky area to work with because the two windows are curved on top and the sheet rock around them is curved. So, straight curtain rods were not an option. 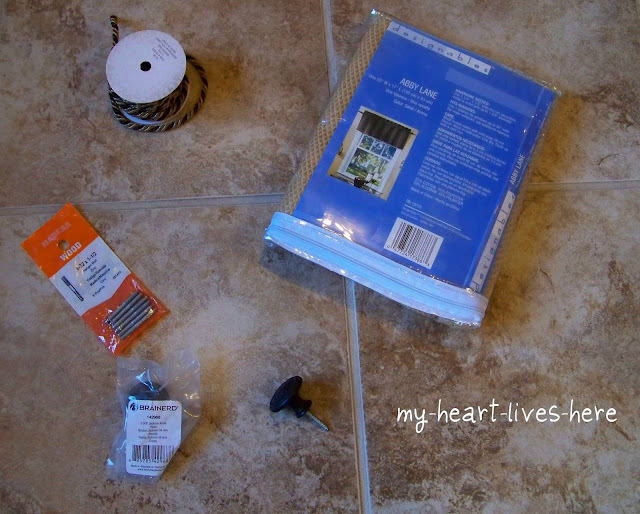 I went to Lowe's and purchased ten cabinet pulls at $2.97 each, two packages of hanger bolts at 98 cents each, and two Abbey Lane valances (sand) at $7.49 (clearance price) each. Then, I stopped at Hobby Lobby for one roll of Decorative Trim at $3.99. So, I am in this project for about $50. I screwed the hanger bolts into the knobs so that I could screw the knobs directly into the wall. (Cabinet pulls come with screws to be screwed into the pull from the inside of the cabinet door). 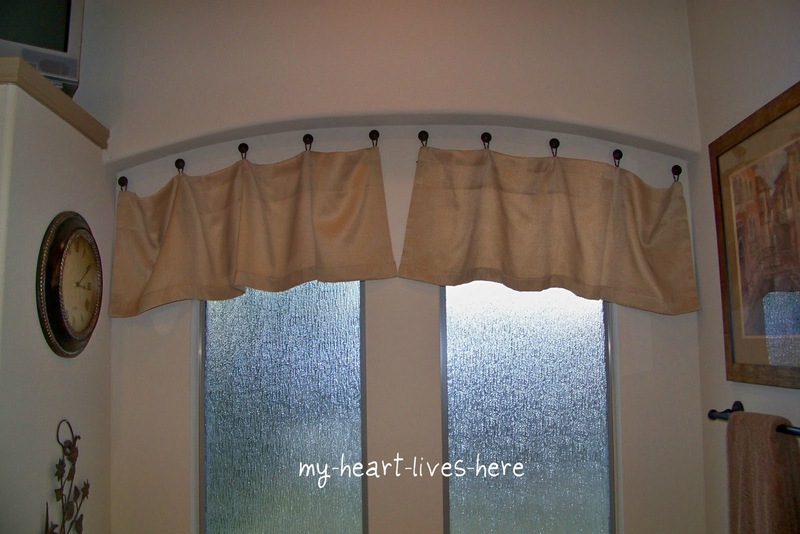 I cut the cording into pieces and pinned it in loops on the back of the valance. (The valance was intended for a pole, but I just ignored the pole pocket.) Here's a picture of cutting between two pieces of tape to keep the cord from unraveling. I screwed the first and last knobs into the wall where I wanted the valances to start and end. Then I spread the remaining three knobs evenly between them. I tried out hanging the valance with pins in before I hand stitched the loops on. I am glad I did this, because my first loops were longer. I liked how they looked until I saw them on the wall. Bits of window peaked through above the valance and looked silly. So here are my final pictures. 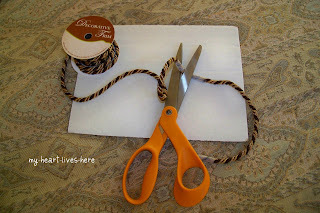 I am delighted with my quick and inexpensive project! I think these are awesome window treatments. Thanks for sharing with my newbie party. It was quite this week. Next week should be back to normal. I think it looks wonderful. That space is really difficult because of the arch and what you did works perfectly. I'm visiting from Amy's Saturday 7. Hope you'll stop by my blog, too. Very neat idea. Your window looks pretty. That looks great! Thank you for joining me at Home Sweet Home!